BestFest Student Film Festival, a project of Best Video Film & Cultural Center, will offer a series of two unique workshops for local high school student filmmakers. Each workshop covers an important but often misunderstood aspect of capturing a scene, led by a local professional expert from the industry. Under the heading “Lights!” and “Camera! 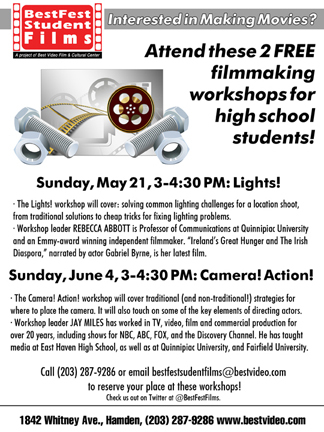 Action!,” the workshops will be held at 3 PM on Sun., May 21 (Lights! ), and Sun., June 4 (Camera! Action!). Each workshop will last 60-90 minutes. They are free for high school students and reservations are highly recommended. BestFest Student Film Festival showcases films by area high school students. The festival is open to all high school students from New Haven, Connecticut, and adjacent communities (East Haven, West Haven, Hamden, North Haven, Woodbridge, and Orange). The first BestFest was held on Dec. 10, 2016. Rebecca Abbott, professor of communications and 2010 excellence in teaching honoree. September, 2010. Rebecca Abbott will cover solving common lighting challenges for a location shoot, from traditional solutions to cheap tricks for fixing lighting problems. Learn about balancing daylight and interior light, filling in shadows, tackling power concerns, and more! 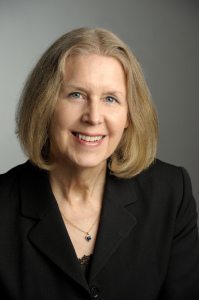 Rebecca Abbott is Professor of Communications at Quinnipiac University and an Emmy-award winning independent filmmaker. 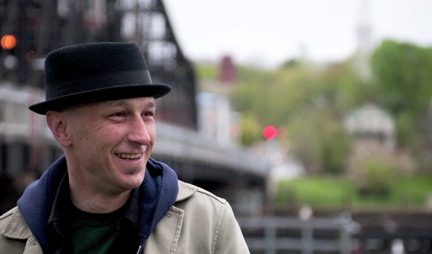 Abbott’s documentary subjects range from aeromedical rescue from mid-east war zones, to the history of jazz music in New Haven, to the impact of war on Veterans and the role of arts in healing. Ireland’s Great Hunger and The Irish Diaspora, narrated by actor Gabriel Byrne, is her latest film. Jay Miles will detail the traditional (and non-traditional!) strategies for where to place the camera in order to best cover a scene, and address the particular challenges of location shooting. Learn about shot selection, coverage, inserts, wilds and more! Miles will also touch on some of the key elements of directing actors. From rough rehearsal, to the rhythm of calling “rolling, action, cut,” to giving notes and making adjustments. Learn about all of these strategies and more! Jay Miles has worked in TV, video, film and commercial production for over 20 years, including shows for NBC, ABC, FOX, the Discovery Channel, HGTV, Versus and DirecTV. He has taught media at East Haven High School, as well as at Quinnipiac University, Fairfield University and the CT School of Broadcasting. He has contributed to such magazines/Websites as Film Threat, Moviemaker, Adorama.com and Techsmith.com, as well as on panels at events including iTVFest, the annual UFVA conference and the All American High School Film Festival. His first book, “Conquering YouTube,” combines the professional and practical tips that he has used on major shoots with the approaches that he employs to help numerous beginners reach for the stars with their own successful projects. BestFest Student Films is created to showcase films by area high school students. The festival will be open to all high school students from New Haven Connecticut, and adjacent communities (East Haven, West Haven, Hamden, North Haven, Woodbridge, and Orange). Best Video Film & Cultural Center (BVFCC), a cultural nonprofit based in Hamden, announces the creation of BestFest Student Films, a new film festival to showcase work by area high school students. The festival will be open to all high school students from New Haven and adjacent communities (East Haven, West Haven, Hamden, North Haven, Woodbridge, and Orange). Beyond presenting students’ films, the festival will serve as an educational resource for student filmmakers. The steering committee plans to assemble a group of expert volunteers—including film industry veterans and educators—to mentor and coach students who seek advice on issues ranging from screenwriting to audio engineering, film financing to editing. Films must be made by students who are currently enrolled in high schools in New Haven, Connecticut and adjacent communities (East Haven, West Haven, Hamden, North Haven, Woodbridge, and Orange). They can be shorts or feature length, narrative fiction or documentary. We welcome animation, music videos and experimental films. Content should be appropriate for a high school viewing audience. Films must be submitted through Withoutabox (link to be added soon). This process is free of charge. For submission questions contact BestFest Student Films at bestfeststudentfilms@bestvideo.com. Find us on Twitter at @bestfestfilms. Want to get on the mailing list for BestFest Student Films and get access to valuable resources for filmmaking? Email us at bestfeststudentfilms [AT] bestvideo.com. Let us know your name and the school you attend. Good luck making your own movie! Read the New Haven Independent‘s coverage of our “The Nuts & Bolts of Making a Movie” workshop here.